Each summer, the Department of Chemistry and Biochemistry at The University of Alabama in Tuscaloosa, Alabama hosts a Research Experience for Undergraduates program (REU), funded by the National Science Foundation under the direction of Dr. John Vincent and Dr. Stephen Woski. Undergraduates from throughout the country with strong backgrounds in chemistry are invited to apply. Participants work with faculty in their research group and take part in informal seminars and social activities. The 10-week program begins each May/June; participants receive a stipend plus housing in furnished apartments. In addition to working with faculty on research projects, participants also attend weekly seminars describing modern research instrumentation, current research of UA faculty, and ethics in science. Research areas for past summers have included molecular recognition, metalloporphyrins, nanomaterials, electron transfer, fluorine chemistry, electrochemistry, magnetic resonance, photosynthesis, separation science, environmental chemistry, bioinorganic chemistry, synthetic organic chemistry, DNA-ligand interactions, computational chemistry, surface chemistry, applications of chromatography, magnetic data storage, anticancer drugs, catalysts. Learn more about previous REU participants and their research projects. 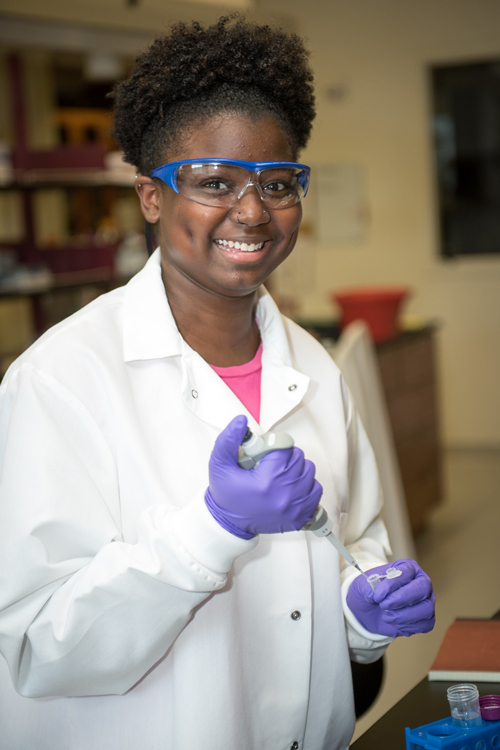 The 2019 University of Alabama Department of Chemistry REU program will run from May 28 through August 2, 2019. Applications, including letters of recommendation, are due by February 28th, 2019. The Department of Chemistry and Biochemistry and The University of Alabama gratefully acknowledge the National Science Foundation for funding of this REU site.